Buy it on: Shocklines, Amazon, Powell’s Books and Barnes & Noble today! Read an interview with Ronald Damien Malfi, download a 7 page pdf excerpt of the novel or read a chat transcript with Ronald Damien Malfi. Robert Crofton, a socially inept and naïve young farm-boy, arrives in Baltimore to write his first novel and to reacquaint himself with an old hometown friend: poet-turned-prizefighter Rory Van Holt. In an effort to resume their peculiar and mysterious friendship, Robert Crofton abruptly ensconces himself in Rory Van Holt’s circle of friends. Robert soon finds himself sinking deeper and deeper into the quagmire that is their lifestyle. They are corrupt and privileged socialites, damaged by extraordinary wealth, gluttony, greed, arrogance, and power. Dreamlike, the characters float in and out of Robert’s life with inebriated casualness while Robert’s innocence invites these characters to subtly abuse and ridicule him while also accepting him, for the purpose of their own relief against monotony, into their monstrous society. When Nigel Sweeny, Robert’s eccentric and doomed cousin, falls is love with Rory Van Holt’s fiancée, Donna Taylor, they all suddenly find themselves trapped in a bizarre and often contradictory love-quadrangle. 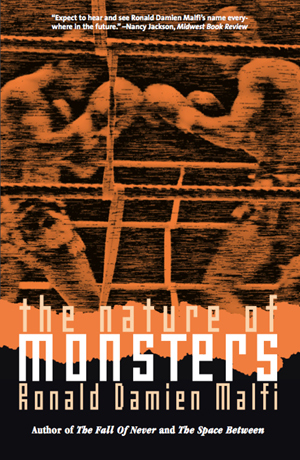 The Nature of Monsters is both uniquely modern and delicately classic in its style and execution. The story is an exercise in human frailty and love, while exploring the struggle between personal gratification and the damning, acquisitive allure of monetary wealth. What have the critics said? Ronald Damien Malfi is one of the more compassionate, insightful and thoughtful new voices in contemporary American fiction. To say he’s a writer to watch would be to be too obvious – he’s a writer watching us. Ronald Damien Malfi is an award-winning novelist and short fiction writer with over 500 publications to his credit, including the modern gothic novel The Fall of Never, which was released in 2004 to critical acclaim. In 1999, he received an English degree from Towson University, and has since spent much of his time traveling across the United States visiting the obscure yet notable locales which serve as the backdrop for much of his fiction. Malfi started writing The Nature of Monsters in the late fall of 2002. After completing a draft of the first few chapters, the author set the work aside and did not pick it up again until nearly a full year later. Even after the manuscript’s completion, and due to the story’s unspecific genre, Malfi tucked the finished manuscript away, unsure what to do with it. As the author has stated, “So again it sat and waited. And waited. And I waited. And together we both waited. And we drank some Red Stripe and smoked some Al Capone cigarillos and boiled pots upon pots of Ramen Noodles and still waited.” Until now.